Friday November 24th – Thursday November 30th! 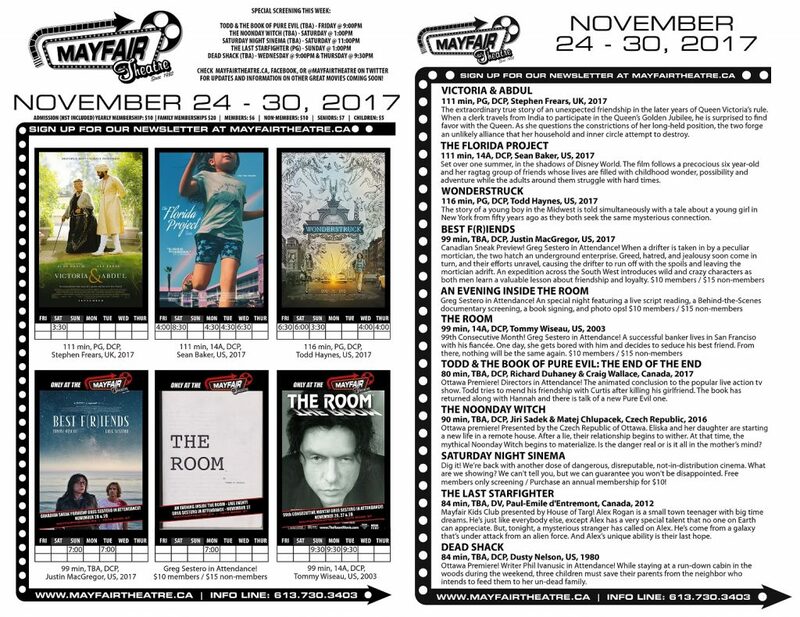 It’s an extra packed week of movies and special guests from Friday November 24th – Thursday November 30th! Greg Sestero in Attendance for An Evening Inside The Room, the Canadian Sneak Preview of Best F(r)iends, and the 99th Consecutive Month of The Room! Held Over for a 2nd Week: Victoria & Abdul, and The Florida Project! House of Targ / Mayfair Kids Club presents the 1980’s video game sci-fi classic, The Last Starfighter! Wonderstruck – the acclaimed Cannes Palme d’Or nominee, from Oscar nominee and 2 x Cannes award winner Todd Haynes! Plus, another dose of dangerous, disreputable, not-in-distribution members only secret cinema at Saturday Night Sinema!